With the recent release of the first of the four Four-focused Divergent eShorts, it seems particularly fitting that the next sneak peek at Veronica Roth's Allegiant should be from Tobias' perspective. We know already that the third book in the young adult dystopian series will be told from both Tris and Tobias' perspective, which is a switch from Divergent and Insurgent, both of which were told entirely from Tris' perspective. Following up on the last sneak peek, which had Tris pondering what might be beyond the fence that surrounds Chicago, we have this quote from Four, which comes to us via BuzzFeed and has Tobias thinking about Tris. At least, we should assume he's thinking about Tris, whose collarbone is tattooed with crows. It's interesting to get an updated perspective from Four on Tris. The last time we were in Four's head while he was interacting with Tris was in the short eBook Free Four, which tells the story of the Divergent knife-throwing scene from Tobias' perspective. Of course, these two have been through so much since then, and it's evident that Four appreciates both sides of Tris. "Sometimes I still forget to look for the gentler parts of her," he says. "For so long, all I saw was strength, standing out like the muscles in her arms or the black ink marking her collarbone with flight." 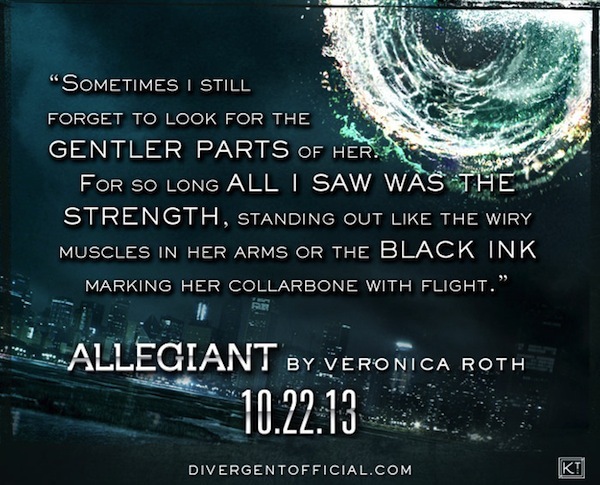 Tris' Divergent status is a reminder that she's more than just one thing when it comes to her personal strengths. She's strong, but she's also compassionate, a trait that's probably been nurtured from growing up in Abnegation. Four being former-Abnegation would probably be prone to appreciate that, when he remembers to notice it. Speaking of Four's Abnegation status, if you haven't read it already, The Transfer released earlier this month. The short eBook gives us some insight into Four's mindset, going back to the day before his Choosing ceremony when he was faced with trying to decide which Faction to choose. We also get a better sense of the tense relationship Tobias has with his father, which has likely played a huge role in who he's grown up to be. It's worth a read for fans of the books, and it's a great way to get into Four's mindset as we wait for Allegiant to release. Allegiant is set to arrive October 22. Amazon has it available for pre-order here. Here's the full schedule of Divergent books/ebooks set to be published over the next few months.